Would you like to save $$$ on your insurance CLICK HERE & let Sandi Simpson with Norton Insurance give you a quote! Noted for its historical significance in Fannin County, Shallowford Bridge is eligible to be recognized in The National Registry of Historic Places. While its fate has been determined without much discord among residents of the area, the location of a new bridge has fierce opposition and great concern over the safety of tourists and residents. During peak tourist season, vehicles often fill the already limited parking areas and park along Aska Road to visit the gem mine, novelty stores, restaurant and tubing businesses. Pedestrian traffic is significant during the warmer months and peak season. The new bridge is scheduled to be built directly in the middle of this already congested area. Excited children, even adults don’t often think about being hit by a vehicle. Locals believe that is what should be of the highest concern and not about being near to the old bridge. The current bridge, while not far from the proposed bridge is just to the South of the busy area. GDOT’s Grant Waldrup recently stated residences and businesses along Aska Road and Shallowford Bridge Road will be minimally affected. Those who live in and know the area well have expressed a much different opinion. “If you want to put a bridge directly behind our parking that is the most dangerous section of Aska Road,” stated Kimberly Wolfe, owner of Iron Bridge Cafe. She sat down with this FYN reporter for a candid interview. “We fought, we tried, we understand a new bridge. We fully support a new bridge. But don’t put it in the most congested area of Aska Road. Cars fly through here 45-50 mph. Imagine if it’s your child, it only takes a second for a car to run off the road. The news our concerns were ignored and currently no further discussion of safety will be addressed by GDOT “brought anger. It brought tears. It made you sick to your stomach when we heard they’re not going to change it,” Wolfe went on to say. 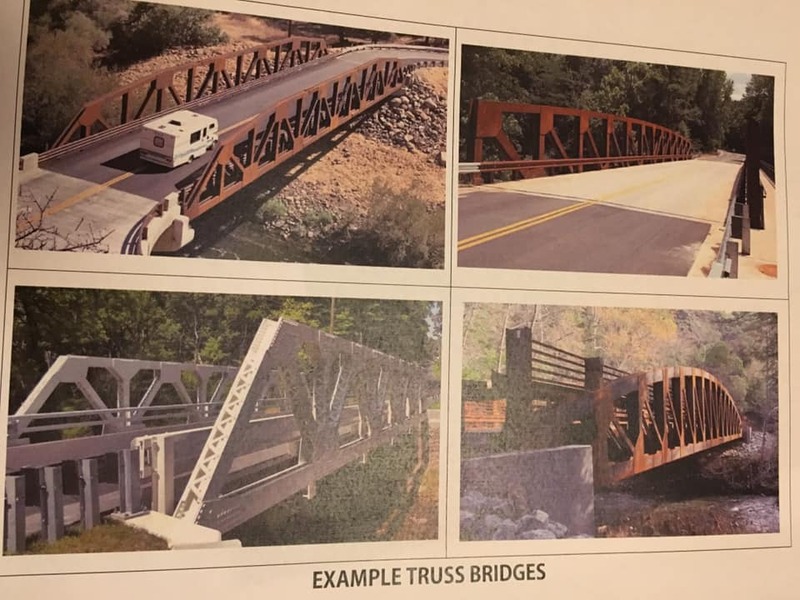 Reaching out to Fannin County Board of Commissioners Chairman Stan Helton for comments on safety concerns, “I am open to address all safety concerns.” After the bridge is built they can consider installing flashing lights, reduced speed or other means of ensuring safety. The bridge is set for construction sometime in 2020. New bridge to be built on the busiest stretch of Aska Road- Are families now at risk? 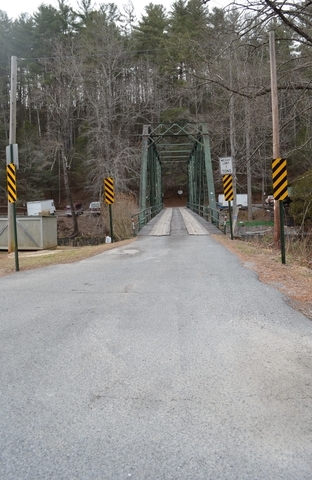 Shallowford Bridge noted for its’ historical significance in Fannin County is eligible to be recognized in The National Registry of Historic Places. Its current fate is at the center of a growing divide between GDOT, businesses, and residents on Aska and Shallowford Bridge roads. Imagine peak tourist season, bridge construction, road changes, businesses and local residents all converging around Shallowford Bridge and Aska Roads. Those who live in this area can not imagine how this became the pending scenerio. A new bridge is supported, it is the location causing concern for current safety and for the area as it continues to grow in the future. Earlier this month, GDOT held a Public Open House in Blue Ridge to explain their plans for the replacement of Shallowford Bridge. Concerned citizens were encouraged to ask questions and complete a questionnaire. Representatives from Michael Baker International, a provider of engineering and consulting services were on hand to offer reasons why this project is imperative. GDOT must repair, replace, or move the current bridge. The bridge does not meet engineering criteria and has many issues, mainly steel related. It is not in safety compliance with federal regulations regarding bridge standards. Considering all available information, it is urgent to address the bridge issues now. GDOT District Engineer (Cartersville) Grant Waldrop said Shallowford Bridge project will start about September 2020. It is expected to be completed in a 12-month time period. While he added residences and businesses along Aska Road and Shallowford Bridge Road will be minimally affected, the residents and business owners expressed a much different opinion. During the Open House, Kimberly and Charlie Wolfe, owners of Iron Bridge General Store and Cafe, located directly across from the current Shallowford Bridge and expected construction area, voiced their fears of how damaging GDOT’s current plan is for the safety of locals, tourists, and their business. Current plans could also destroy the businesses in the construction area having limited to no customer access for 12 months. A highly congested area in the summer, and consistently busy in the offseason, they are concerned what it means in regard to safety for everyone. In addition to increased traffic, designated parking spaces, vehicles parked on both sides of Aska Road is increased foot traffic which often includes young children excitedly dashing about. The bridge is set to intersect with Aska Road in the middle of this busy public area. 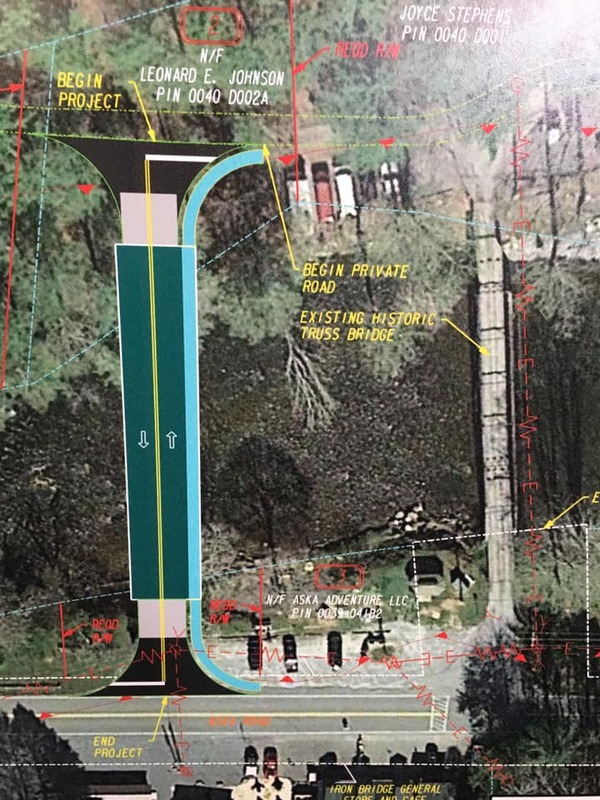 Plans include a new trussed, concrete bridge to be constructed with two nine-foot lanes and a 10-foot walking path across the Benton-McKaye Trail relocation. Where will the new Iron Bridge be? Citizens voice their opinion over placement. Blue Ridge, Ga. – Citizens united to express concerns over the Georgia Department of Transportation (GDOT) initial plans to replace the Shallowford Bridge or “Iron Bridge” located off of Aska Road, and now they unite once again to present solutions rather than complaints to GDOT about the future of the Aska Adventure Area. Originally the fate of the Shallowford Bridge came into question when plans emerged for a replacement bridge in the area. GDOT Proposal of replacement site for the Shallowford Bridge. 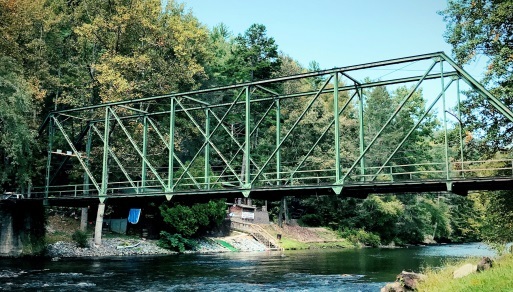 Constructed from a steel truss frame and having a wooden deck to allow for traffic, the 100 year old Shallowford Bridge spans 175 feet crossing the Toccoa River. The bridge also forms part of the Benton MacKaye Trail. These concerns were relieved when GDOT announced that they would not be demolishing the Shallowford Bridge, but rather would be constructing a new bridge nearby. GDOT also expressed that they would be willing to “hand over” the bridge to become property of Fannin County leaving the county responsible for maintenance. The new location of an upgraded bridge has many residents and business owners in the area concerned. Set almost directly beside the Shallowford Bridge, citizens feel that this could cause more congestion and more safety issues in the area. “This one (Shallowford Bridge) has been on the radar for a long time. Out of 100 it scores 13 on sufficiency,” Emil Dunn a member of the State Transportation Board elaborated on the need to build a replacement bridge. Ron Grace, a resident of the Aska Adventure Area, proposed a different site for the replacement bridge. This site located beyond the Shallowford Bridge, traveling in the direction of Newport Road, would utilize a small portion of land currently owned by the U.S. Forest Service. Design options shown by GDOT. One similar to these designs will be constructed for the replacement bridge. 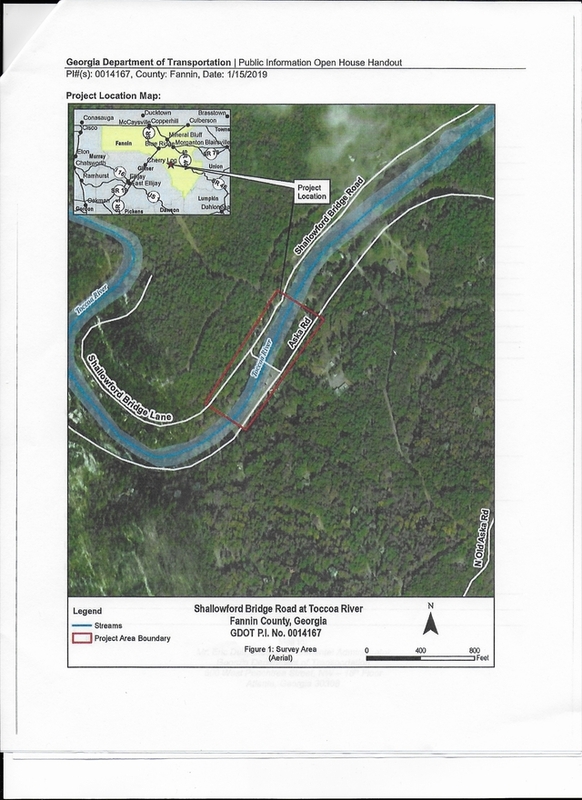 According to Grace, GDOT had only considered the proposed site which they presented to the public and a site upstream closer to the Toccoa River Restaurant, but that the second site would have required the purchase of a home. “Not knowing anything, they put it there because they thought it would look the best and have the least amount of impact,” Dunn spoke of GDOT’s reasoning for the placement saying that it came from an engineer’s perspective and that the proposed site would have the least environmental impact. Stephens spoke of adding additional parking near the bridge if it were to be moved to U.S. Forest Service land and an area where kayakers and tubers of the Toccoa would have a place to get in and out of the river. 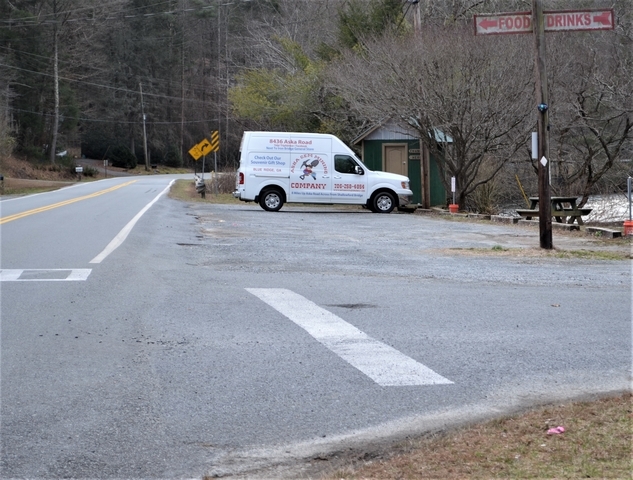 While citizens seemed agreeable to approaching GDOT with the new proposal site up river, questions still came about regarding the upkeep of the original Shallowford Bridge. Beyond Fannin County’s already budgeted roads and bridges line item, Dunn also pointed out that there is the possibility of extra funding from the state through the use of a Local Maintenance and Improvement Grant (LMIG). 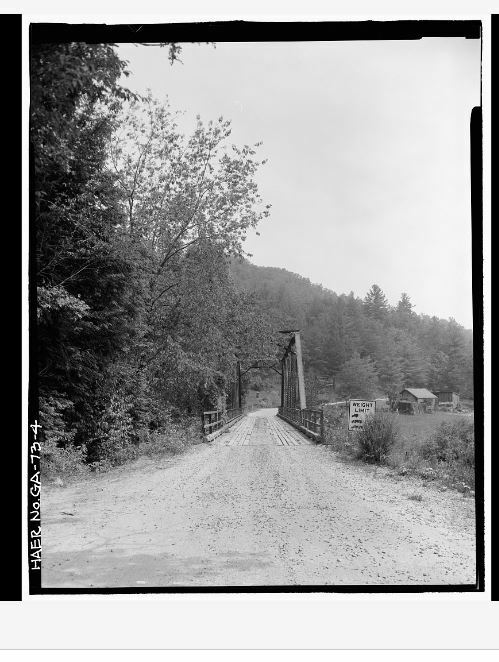 Historical photo of the Shallowford Bridge courtesy of the Library of Congress. If a typical LMIG is applied for by the county and accepted by the state, it allows for a certain amount of money to be designated toward a county project with the county being responsible for a percentage of the cost. 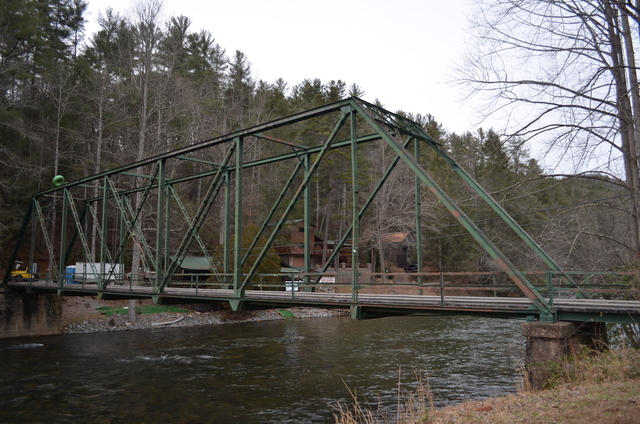 Another option for restoration and maintenance of the Shallowford Bridge was presented by a resident saying that it might be possible to have the bridge put on the Historic Register which would allow for extra funding to be received for its preservation and care. According to the Library of Congress the “Iron Bridge” is one of 50 Pratt truss bridges recorded in the state of Georgia. Three of of the 50 bridges on record reside in Fannin County. The fate of the new Shallowford Bridge is yet to be determined, but citizens hope that their voices will be heard before a final decision is made.